From the back cover: "Delia Hopkins has led a charmed life. Raised in rural New Hamshire by her beloved widowed father, she now has a young daughter, a handsome fiance, and her own search-and-rescue bloodhound, which she uses to find missing persons. But as Delia plans her wedding, she is plagued by flashbacks of a life she can't recall...until a policeman knocks on her door, revealing a secret about herself that changes the world as she knows it -and threatens to jeopardize her future. 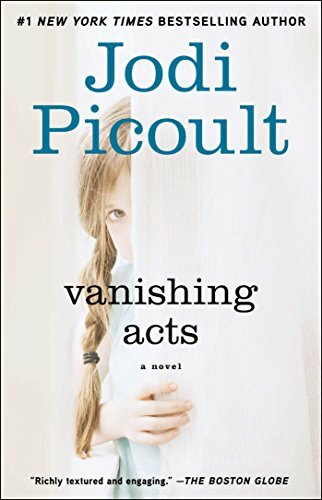 With Vanishing Acts, Jodi Picoult explores how life -as we know it - might not turn out the way we imagined; how the people we've loved and trusted can suddenly change before our very lives; how the memory we thought had vanished could return as a threat. Once again, Picoult handles an astonishing and timely topic with understanding, insight, and compassion." I really enjoyed this book and I'll definitely read more by this author. Released for week #36(hand on front cover) of the Never Judge a Book By Its Cover release challenge.